An Amazon Bestselling series with 130+ 5-star reviews. Romance is overrated. Marielle has had it with boys, especially after her ex turned vile. That is until Faris comes along with his deep, dark eyes and tantalizing secrets. Inevitably, he draws her in, even though she's been warned not to trust him. But when attempts on her life begin, Marielle suspects Faris. His seductive ways and stalking episodes are a dead giveaway, right? Her heart falls into turmoil. Should she run into his arms or run away in fear? Desperately, she tries to find answers, but what she finds is a powerful monster who wants to torture her for mere pleasure's sake. Because Marielle is right in the middle of an ancient battle between two immortal Djinn. They both want something from her. One, her devotion. The other one, her life. 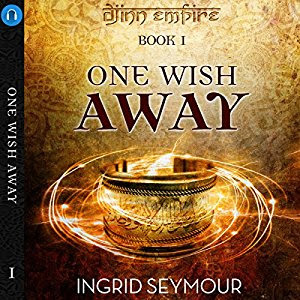 One Wish Away is a young adult paranormal series that will appeal to lovers of Hush Hush, Twilight, and the Fallen series. I would recommend this book teens and up who like paranormal romance. This was a fun, light read as I haven't read any Djinn themed stories before and the concept was totally new to me. I liked the characters and Marielle grew on me as she became less angry at the world around her and made selfless choices with her wishes. I enjoyed all the teen drama at college. There was plenty of drama as Marielle faced intimidation from both real world people and others from the magical realm. The story was very entertaining and held my attention throughout. The little touch of romance was lovely and I look forward to following on with the rest of the series.